As most fans already know, we recently received a new trailer for the highly-anticipated Kingdom Hearts III. In it, we got our first look at the previously announced world of San Fransokyo from Disney’s Big Hero 6. This trailer is the latest of a slew of news and information on Square Enix’s newest installment to the beloved franchise. Just in this year, we’ve seen multiple trailers revealed at various events, along with several articles and interviews with the developers of the game. But as I watched the newest trailer, I began to think: do we know too much about Kingdom Hearts III? It feels ironic asking this question since, up until recently, news on anything involving the game was scarce after its initial reveal in 2013. Fans craved for any slither of news we could get, and even the tiniest bit of information made the community wild with excitement. Fast forward to around 2017 and 2018, and we now have more content than we know what to do with. It seems that the first half of this year alone has given us more details on Kingdom Hearts III than the previous four years before it. But with all this news comes the possible worry of over-exposure. Can Square Enix continue this pattern without revealing too much? Now, before I go any further, I will say that I’m just as grateful as any fan for all the news we’ve received. Like everyone else, I too get excited when I learn more about an upcoming game that I’m looking forward to. With every new reveal, however, I can’t help but wonder if I’ll feel satisfied with the game once it releases. I get a little more concerned with every new world reveal and each trailer drop. I mean, the Kingdom Hearts community is already aware of seven new Disney worlds. On top of that, we also know of some major plot twists, such as Aqua falling into the hands of Xehanort and Riku seemingly encountering Replica Riku. Some of you out there might counter my arguments with responses such as “If you’re so concerned, why not just avoid all the new stuff so you can go in fresh?” Well, first off, I’m a gaming journalist — my job revolves around paying attention to all the news out there. Second off, I get excited and curious, just like any normal fan. I look forward to seeing the beauty of Kingdom Hearts III. So, while I am completely aware that I have the option to refrain from any reveals that occur, I can’t help but immerse myself in every little new element that comes out, just like how I am sure most of you can’t either. With that said, it doesn’t change the fact that the more we see of Kingdom Hearts III, the less there is that we don’t know about. That’s a little unsettling. There’s More to Come… Right? Now, there’s always the chance that everything we’ve seen so far is just the tip of the iceberg. 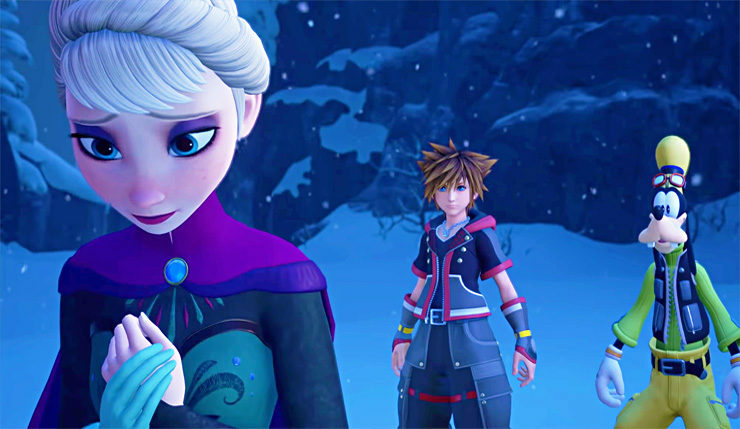 Throughout various interviews, long-time Kingdom Hearts director Tetsuya Nomura has stated several times that plenty of content will exist within Kingdom Hearts III, but how much is “plenty”? With everything shown so far, the idea of fresh content becomes less and less likely. We do know that more trailers and reveals will arrive soon. Nomura has previously mentioned that we will know of every world before the game’s release. While that sounds exciting, that leaves nothing fresh to awe players. I could ultimately be wrong in the long run. Maybe Square Enix will surprise me with something I, nor any other fan, was expecting from the series. To sum things up, while learning more about a new game can really invigorate the community, there is a fine line between enough and too much exposure. Show off too much and your game can suffer from a disappointed fan base. For both the fans’ and the developers’ sakes, I hope that Kingdom Hearts III lives up to the mantle that has been set before it. We as fans can only trust that Square Enix has chosen what to reveal wisely and that hidden secrets still remain. How do you feel about all this Kingdom Hearts III news? Let us know in the comments below! Also, be sure to follow us on all our social media pages for all things gaming! Sony’s Response & Captain Marvel News – Power Up Podcast Episode 35.